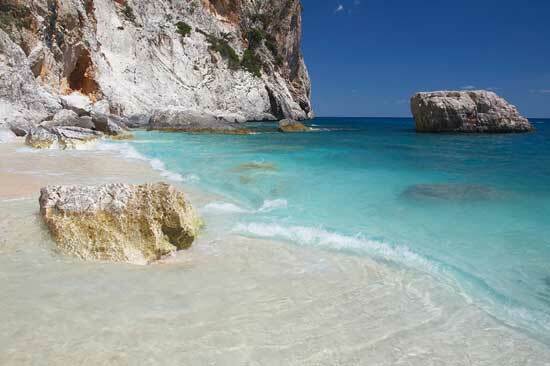 Wow folks, sorry for the intense delay in my Sardegna update… due to a technical difficulty I was unable to update before. Ah where to begin? Well… first of all I can no longer stomach the thought of Pane Carusau (the traditional Sardinian flat bread which is really more like a cracker than anything else), Pecorino Sardo (traditional sheep-milk cheese) or cured sheep meat…. while these products are delicious I was totally saturated after 5 full days of their consumption. Contrary to my initial assumptions, we did not eat as much fish as I had hoped… though Sardegna is an island, prized for the production of delicious products including Lobster and Bottarga (cured tuna egg sacks) we were only taken to one fishery to see the ways of traditional fishing that has not been changed since the Medieval times (think wooden boxes and small tin fishing boats). It was nice to see the pride of these people for the products they produce… refering to mainland Italy as “The Peninsula” I entered the land of Sardegna feeling as if I had escaped the world of Italy almost completely… an entirely different cuisine, culture, and even language in some places..
Strangely enough, I also directly experienced the fears of climate change that are quickly becoming relevant on an international scale. What am I talking about? Well.. aside from the fact that we were in Sardegna in February (off season) our final day on the island we experienced some of the most intense snow storms I have ever seen in my life… More snow than I have ever seen in Parma for sure… In fact, these snow storms made most European news as they were completely abnormal to the regular climate of the island. We almost thought we wouldn’t make it out of there because there was a blizzard that made our enormous tour bus into a mobile vomit facility (about 6 people lost their sheep on the bus and it made for an incredibly unpleasant return to Alghero..where we ultimately caught our plane back to Parma. Nonetheless, despite the close quarters with my classmates and the over consumption of meat and cheese, I really would love to return to Sardegna under less strained conditions. 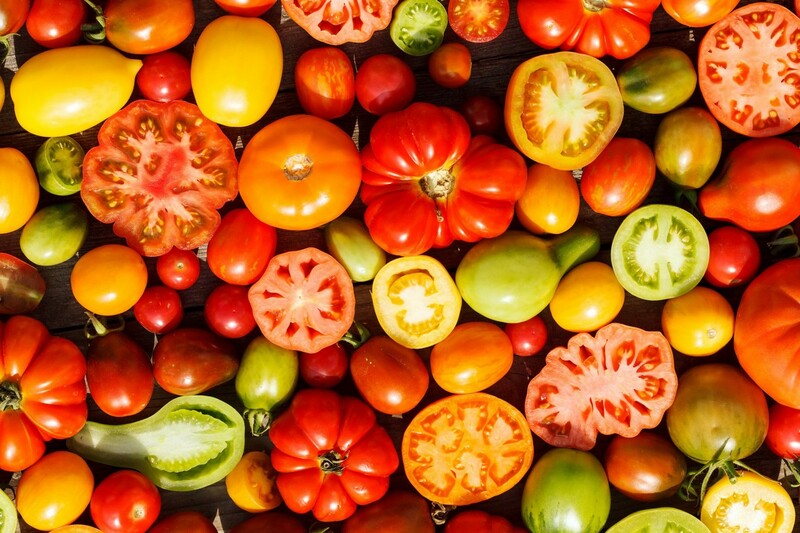 For example, due to our concentrated meat and cheese consumption, not only did many of us experience less than pleasant digestive issues (use your imaginations) but also, the day we were offered vegetables at a local winery everyone jumped to the plate like we hadn’t seen anything green in months… my mouth felt like it was at Disneyland after that first bite of fennel…and I don’t even particularly like fennel. Ok let me get to the good stuff.. I’ll add some of my pictures from the trip so you can get an idea of not only the amount of food we consumed, but also the spectacular places in which we dined… absolutely unforgettable. The first sign of vegetables that we saw in 2 days! Fennel! GLORY! Seadas: Traditional Sardinian dessert: Melted pecorino inside a fried bread pocket topped with fresh honey. A diet option. Artiginal (sp?) Sardinian beer… very delicious. The girls and I dressed up like Zorro for Carnivale….ahh being festive. This bread was so pretty I didn’t want to eat it…but alas, I did. 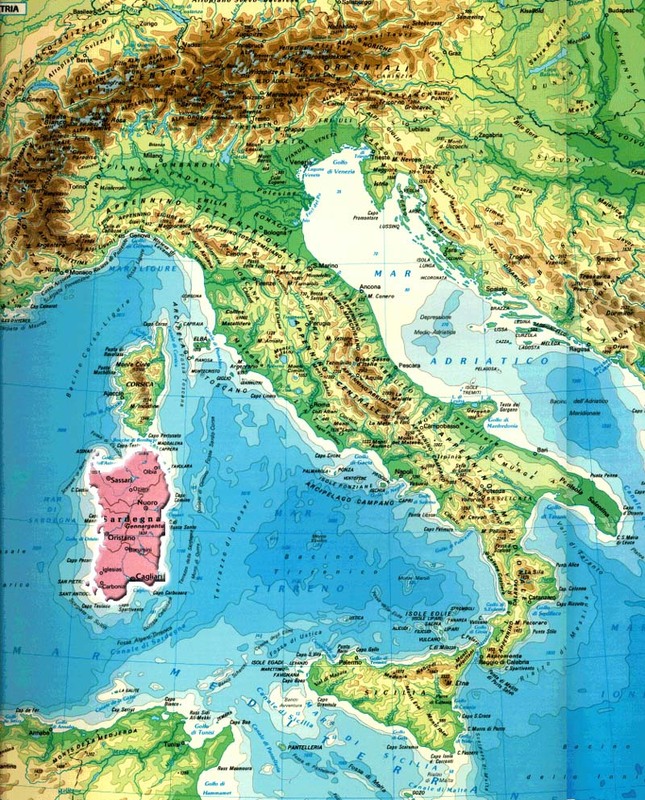 Tomorrow morning the UNISG group and I are going on our first culinary field trip to the beautiful island of Sardinia (Sardegna in Italian). We will be visiting various agritourisms, meat and cheese producers, a mask museum, wine producers, beer producers, and dining in some of the most authentic and delicious places you could imagine. Sorry some of these websites are only in Italian, but you get the idea… I have been dieting for a week in preparation for this momentous trip, though I will most likely come back with zero pants that fit and a happily expanded waistline… ahh the life I lead. Until then, I’m off to dig into some real Grassroots Gourmet. Another day, another delicious food excursion. The past two days here at UNISG we had the opportunity to study Parmigiano Reggiano in delicious depth, going to not only the production facility, but also specific regulation cow farms, the official Parmigiano Reggiano Consortium, a cheese aging warehouse, as well as an international packaging and handling facility. First of all, I must say that Parmigiano Reggiano is not the same thing as Parmesan ‘cheese’ gratings found in the little green Kraft can. Oh no, real Parmigiano Reggiano is a extremely delicate and well protected product, produced specifially in the towns of Parma, Modena, Reggio Emilia, and small portions of Bologna and Mantova. 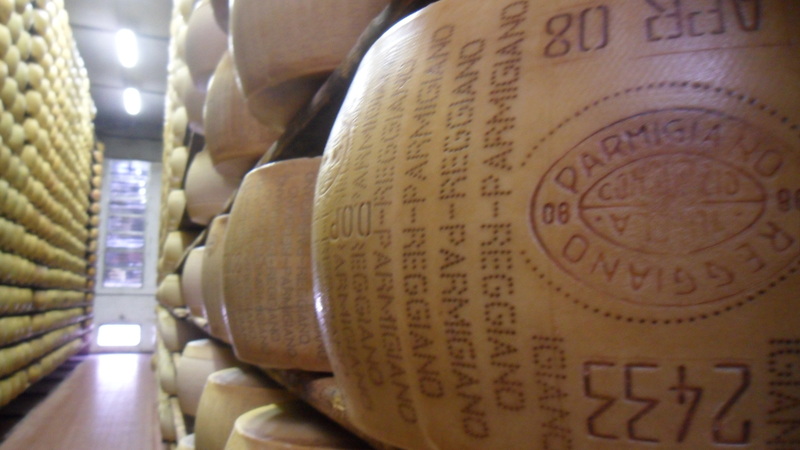 In fact, there are only 400 licensed producers of the product in all of Italy. As Parmigiano Cheese buffs like to say, the production of Parmigiano Reggiano starts at the cow. In order for a farm to produce milk for Parmigiano cheese, it must feed it’s cows cereals and hay that is grown only in the region of Emilia Romagna. It is thought that by keeping this production completely localized, it is easier to regulate and maintain its quality standards. Minimum aging period: 12 months, though it is usually not sold until 18 months of age. Something about the product’s composition makes it extremely beneficial for gastro-intestinal health. I don’t want t bore you with facts and figures, so I’ll leave you with some photographs of my experience in the past 2 days. To say the least, I have had enough Parmigiano Reggiano to last a lifetime, though luckily I don’t believe I will ever run out of the product, given that I live here in Parma. ohhhh the difficult life I lead. Just when I thought I was in a country full of edible delights, delicious pastries, pastas, cheeses, and wines, I come across a cheese that I only imagined to be true in my most vivid nightmares: Casu Marzu. Coming from the beautiful and enchanting island of Sardinia, off the west coast of central Italy, Casu Marzu is considered a traditional delicacy. Let us first deconstruct the cheese’s name…..
Casu Marzu, is Sardinian dialect for rotten cheese (in Italian formaggio marcio). Rotten?! Absolutely. Though the cheese starts as a pleasant and delicious form of Pecorino, it then undergoes various processes of decomposition by being left outside for extended periods in order to reach its final and ‘perfected’ state. 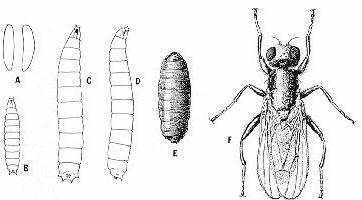 When the cheese is in it’s advanced stages of decomposition, the eggs of the Phiophila Casei larva species are implanted into the cheese and allowed to hatch. mmmm worms. The worms are an essential part of the development of the cheese’s texture and taste. It is thought that as these larvae hatch and begin to eat through the cheese, they break down the cheese’s fats giving it an extremely soft and unique texture. The taste of the cheese has been compared to an extremely ripe gorgonzola…only without the blue veins and of course, the sanitary guarantee. Aside from the disgusting, the cheese has been the topic of much controversy in Italy in the rest of Europe regarding issues of sanitary health and legality. It has been found that mass consumption (or any consumption in my opinion) of Piophila Casei larvae can cause various health concerns, including vomiting, bloody diarrhea, abdominal pain, and gastric lesions. This is because this particular breed of larvae is somewhat resistant to human stomach acids, allowing them to live and reproduce for extended periods within the gastric system!!! Regardless of its legal state, this cheese is continued to be produced in Sardegna, and can be found on the black market for double the cost of normal Pecorino cheese. If that doesn’t tempt you enough, Casu Marzu might be the world’s only cheese that requires protective eye-wear. 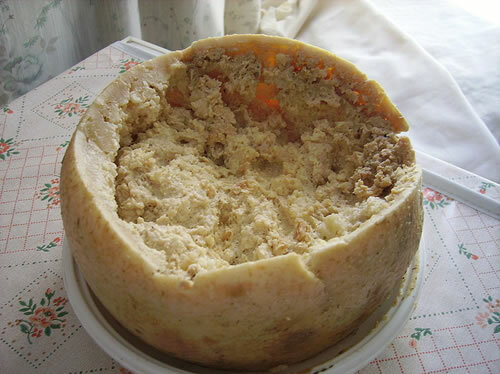 Casu Marzu is considered toxic if the larvae inside have died and fermented, therefore it is required that this cheese is eaten while the worms are still alive. It is important to note however, that these worms have the capacity to jump has high as 6 inches. If they make contact with the eye, they may lay eggs immediately and cause further vision concerns. Because of this minor detail, many prefer to place their slice of Casu Marzu in a paper bag in order to suffocate the living worms. Once the popping sounds of the larvae hitting the bag have subsided, the cheese is safe to eat. Now you AND your dog can have worms! I don’t know if this cheese concerns anyone else, but there is a distinct possibility that I will have to eat this next week on my field trip to Sardegna… basically if I don’t update in 3 weeks, I am either dead/hospitalized by cause of intestinal worm infestation..
Grassroots Gourmet folks, Grassroots Gourmet.